It’s usually a simple and safe procedure to mount and dismount a motorcycle. If it is’t done correctly however, things can quickly go wrong. This guide explains how to correctly mount and dismount a motorcycle. Always mount a motorcycle from the left. Before getting on, have a good look behind to ensure it is safe. If parked at the roadside, always mount the motorcycle from the kerbside, away from moving traffic. One reason being that you get on the motorbike from the left is that almost all kickstands / side stands are on the left-side of a motorcycle, therefore the bike will lean towards the left when it’s on the stand. If you mount from the right, you’ll need to pull the bike up straight and off of its stand before mounting. For a heavier bike, this can risk losing balance of the vehicle making it tip over. Getting on the motorcycle from the left means you’ll mount the vehicle whilst it’s still securely on its stand. Finally before getting on, you’ll need to ensure you have control of the motorcycle. So that it doesn’t roll when getting on, apply the front brake. You can now mount the motorcycle. Now that you’re seated, you should have a comfortable and safe riding position. Whilst holding the motorcycle in an upright position, you should be able to reach all foot and hand controls comfortably and be able to support the motorcycle with two feet on the ground. 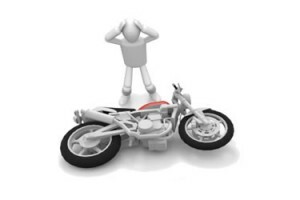 Before dismounting the motorcycle, apply the front brake to secure the vehicle from rolling. As with mounting, always dismount away from the road side and to the left of the motorcycle. Now that you are comfortable with mounting and dismounting your motorcycle, you will on occasions need to push, or ‘wheel’ your motorcycle. This could be down a footpath to get to a road for example. Practice wheeling your motorcycle, initially in a straight line, then to the left and right and in circles. Keep your motorbike slightly leaning towards yourself for best control and balance whilst keeping your right hand on the front brake so to control speed.